Art Inspired Colorways :: New Playsilks! When I say I don't sew, I don't mean I can't. I mean I choose not to because it is *so* easy to get sucked (back) into the fabric vortex.... bwahahaha. 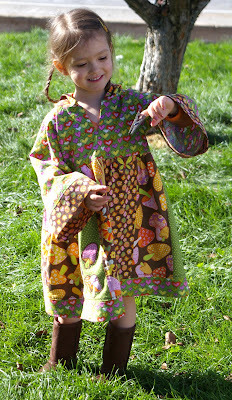 But this little dress pattern, made by my friend Diane for her daughter, broke 4+ years of sewing silence (ok, I *do* sew silk regularly, but no quilting, no clothing, no new fabric). I *had* to make one for Rowan. 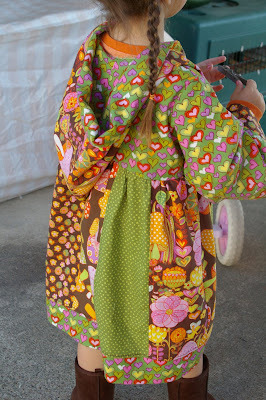 The pattern is the Sydney Dress (Euro Hoodie) by Modkid at Material Gal and it rocks. Super well written, fun and easy to make. My only problem was that I cut the skirt strips one size too big and was baffled as to why I had a 70" skirt and a 50" hem band. Oops! There are so many possibilities for varation and modification in this dress that I didn't stop (*gasp* shock, I know) with fabric for one dress, but also ordered fabric for a holiday dress, too! 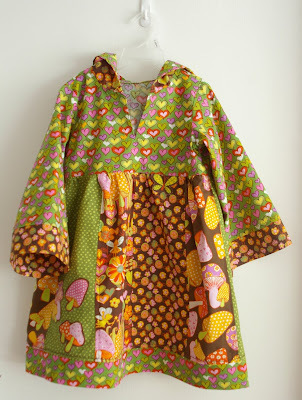 Here is #1, made with the Marie Webster Merry Mushrooms line of fabrics. Nice weight (the finished dress is fairly substantial, it could be done with much lighter fabric for warmer weather) and very vintage look. I went for the pointed hood and strip skirt. 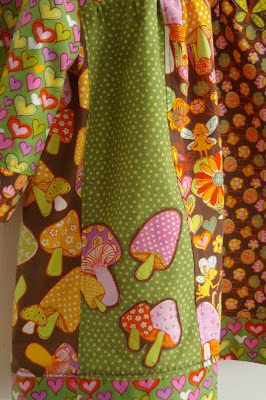 I did my topstitching with a feathery decorative stitch and did one panel with applique mushrooms. 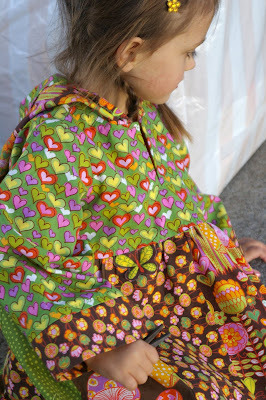 The size 4T fits true and the options for lengthening and shortening skirt and sleeves are nice to have. Sorry for the blur~ my camera and I are not on speaking terms about this. I will post modelled pictures when my model is available! 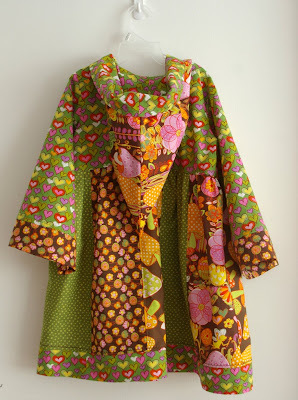 The second dress is going to be made with fabrics from the Riley Blake holiday line in the pinks and greens. I feel the vortex.... sucking.... sucking me ..... in! The Riley Blake fabric is calling to me already for a few weeks. Sofar I was always going "LALALALALA" I can't hear you! Not sure though how much longer I can resist! be MERRY Sue! be Merry! That is absolutely ADORABLE!! Thank you for sharing :) You sure didn't waste any time in completing it! I have some of the "Be Merry" line if you need it. Thanks again! What a sweet design! I like you choice of fabrics! This is one of my favorite patterns :) I loved making it and have some others in the works. LOVE it! I feel for you being sucked in by the fabric vortex LOL:)))! She looks adorable in it! Any pics of the second one?......or third may be?